What is worship like at St. Peter & St. Paul? 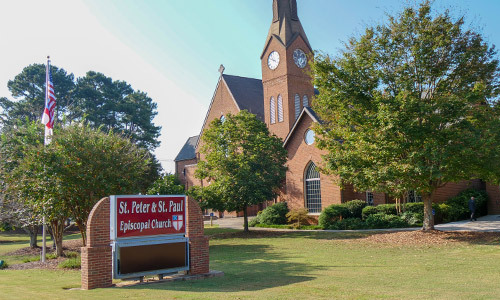 Worship at St. Peter & St. Paul follows the Episcopal Church’s Book of Common Prayer. Thus, our worship is “liturgical,” following a regular format of prayers and hymns and sacraments (similar in rhythm to worship in Lutheran, Roman Catholic, Methodist and some Presbyterian churches). Our standard worship service is the Holy Eucharist, (also known as Holy Communion, or the Lord’s Supper) and lasts about an hour depending on which service you attend. The Eucharist includes hymns, several readings from the Bible, a sermon and prayers (“The Liturgy of the Word”), and communion (“The Liturgy of the Table”). All baptized Christians may receive communion. To learn more about how and why we worship, including a walk-through of our service, Click Here. For an online Book of Common Prayer, Click Here. We usually use “Rite II” on page 355 (and “Rite I” in Lent, page 323). To hear or read sermons, Click Here. Are the three services different from each other? The format is basically the same, but they feel a little different. Our 5:30 Saturday night service is a smaller service of roughly 40-50 people, and without music. Our 8:00 AM Sunday service includes hymns and 60-70 people. Our 10:30 service includes music from our choirs, and gathers between 200 and 300 people depending on the season. Sunday School for all ages is between services, from 9:15 to 10:15. All infants and children are welcome for all of worship at any service. A Nursery is also available for infants and toddlers from 9:00 AM to noon, during Sunday School and the 10:30 service. Children’s Chapel is also available at the 10:30 service for young children during the sermon and the prayers. After the Gospel reading, kids up to second grade go to a separate room for a children’s lesson based on that reading. They join their families for communion. How does worship feel at St. Peter & St. Paul? That depends on what’s familiar to you. 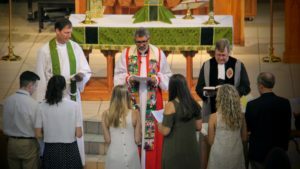 Our style of worship is fairly typical for the Episcopal Church, not too formal and not too loose. We try to be thoughtful in how we worship, engaging God with a sense of purpose and congregational involvement. Our music draws on hymns and choral music, and we are led by an adult choir, a Children’s Choir and a Youth Choir. We are informal, yet reverent. We stay relevant to daily lives while rooted in tradition. Some folks come in jeans, some wear ties, all are welcome. We focus less on politics and more on Christian living. We honor the Bible as the Word of God, and we strive to put Jesus Christ at the center of who we are and all we do. Be our guest and see how the experience feels to you. We hope that you find connection with God and a warm welcome from our people. God bless you always!